This divine plumping Hyaluro-serum offers a refreshing and clear gel consistency containing high concentration of our natural hyaluronic acid duet. It plumps the skin up, filling deep wrinkles. It restores the firm tissue of the skin for improved tightness. Loaded with hyaluronic acid, the skin is dense, plumped and smoothed. 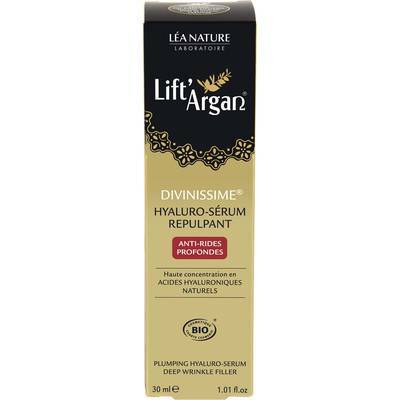 Precious active ingredients: high concentration of our natural hyaluronic acid duet that is effective both on the surface and deeper; rose Jericine® with plumping properties; hydrating argan pulp. 43 % du total des ingrédients sont issus de l'agriculture biologique.